After seeing Gyleen Fitzgerald on The Quilt Show recently, I bought her book and tool. She advocates making her pineapple blocks to turn “Trash to Treasure.” So, one Sunday morning I went through my gigantic garbage bag of scraps and pulled out all the yellows, golds, purples, violets, etc. then cut them into 1.5 inch strips. I added about six fat quarters in those colors as well. I even used three different purple prints for the 2.5 inch (cut) centers to add variety. I have been sewing these up into blocks ever since. It is amazing fun and now I have 32 blocks sewn already. Although, Gyleen’s patterns in her book are very simple layouts with just a couple of plain borders, I am considering this design I made up in EQ7. I will need 100 blocks, with some of the blocks having either 2 or 1 purple “corners” to achieve the EQ7 pattern with the sort of internal border of purple diamonds. 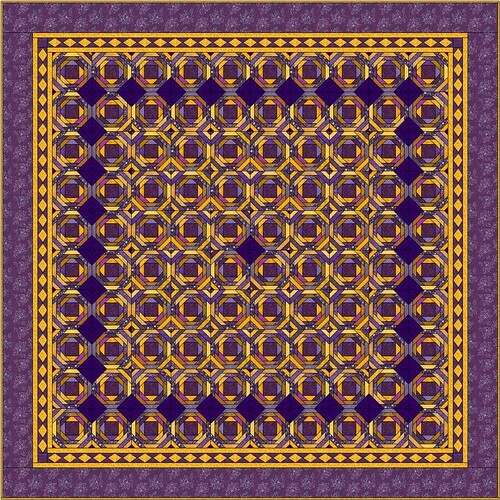 I am looking forward to doing some actual shopping for the external border fabric in some nice, new purple and gold print. I will keep you posted on my progress. 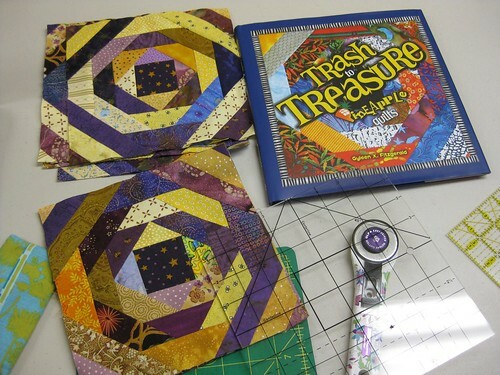 This entry was posted in Purple Pineapple, Quilting. Bookmark the permalink. This looks like a fun project! I’ll have to go check out the book myself. Thanks for sharing. The purple and gold looks like royalty. 😀 I’m impressed at what one can do with EQ7. I bought EQ6 but don’t know how to use it and have been looking for the book EQ6 Simplified so I too can design beautiful treasures like this.